What should patients expect during an eye examination? What common eye conditions usually require treatment by a ophthalmologist? What types of OTC eye care products are available? What is the structure of the eye? What inactive ingredients are contained in OTC eye care products? "Oh, something is wrong with my eye!" We have all said this at some time. How uncomfortable it can be! Fortunately, many common eye (ocular) disorders disappear without treatment or can be managed by self-treating. Various products -- from artificial tears and ointments to ocular decongestants -- are available over the counter (OTC). These products can help with dryness, itching, or excessive watering of the eye. However, a word of caution...In some instances, what may seem like a minor eye problem may lead to a severe, potentially blinding condition. So, always check with your doctor for any persisting eye symptoms or problem. if you use an OTC eye care product for 72 hours without improvement of the symptoms being treated or the condition worsens, you also should see a doctor immediately. If blurring of vision, double vision, eye pain, or visual loss is one of your symptoms, see an ophthalmologist (MD) immediately. the types of OTC eye care products that are available and the disorders in which they may be useful. Routine eye exams today often use state-of-the-art technology to examine all portions of the eye in order to both determine the eye's refractive state (whether or not glasses are necessary) and allow the diagnosis of certain eye diseases, such as macular degeneration and other retinal diseases, cataracts, glaucoma, and diabetic changes in the eye. Vision problems may be due to either a need for glasses or a disease of the eyes. Your eye care provider will determine the cause of any vision loss and evaluate your eye health. A prescription for glasses will be provided if needed. Contact lenses or refractive surgery, such as LASIK, may be discussed. If eyeglasses are prescribed, an optician will fit you for eyeglass frames and order the appropriate lenses, which may be for distance or near or may be for both, as in a bifocal or multifocal glass. Blepharitis: Blepharitis is a common condition that is caused by inflammation of the eyelid. It results in red, scaly, and thickened eyelids and typically some loss of the eyelashes. Blepharitis may be due to either bacterial infection with Staphylococcus epidermidis or Staphylococcus aureus, seborrheic dermatitis (a type of skin inflammation of unknown cause), or a mixture of the two. It is sometimes associated with rosacea of the face. The most common complaints of blepharitis are itching, flaking of the lids, and a feeling of burning of the eyes. Blepharitis is initially treated by applying hot compresses to the affected lids, followed by an eyelid scrub. If the condition persists, you should see the doctor, who may prescribe antibiotic eyedrops, eye ointments, or oral medication. Lice: The eyelids can become infested with one of two different lice, the crab louse (Phthirus pubis) or the head louse (Pediculus humanus capitis). Lice of the eyelids cause symptoms and signs that are similar to those of blepharitis (red, scaly, and thickened eyelids, usually with some loss of the eyelashes). It is common in young school-age children. One can sometimes see movements of the adult lice at the base of the lashes. Petrolatum or a non-medicated ointment is applied to the eyelid and suffocates the lice eggs. RID, NIX, A-2000, or any other preparation that is designed for lice eradication in the hair should not be used near the eyes. Contact dermatitis: Contact dermatitis is an inflammation of the skin that causes swelling, scaling, or redness of the eyelid with intense itching. This condition usually is triggered by the topical use of a product (soap or makeup) or exposure to a foreign substance. If both the upper and lower eyelids are affected, the cause of the inflammation is likely to be an allergic reaction. Even if the foreign substance has previously been used for many years without reaction, allergy can result. Antihistamines that are taken by mouth can be used to treat contact dermatitis of the eyelid. Discontinuation of the offending agent is necessary to minimize recurrences. What common eye conditions usually require treatment by an ophthalmologist? Trauma: Blunt trauma to the eye requires immediate evaluation by an ophthalmologist. Trauma to the eye can cause bleeding into the eye from ruptured blood vessels or result in structural ocular alterations that may cause detachment of the retina. Any of these situations can seriously impair vision. Abrasion: An abrasion usually occurs when a fingernail or other foreign object rubs across the cornea or conjunctiva and removes some surface tissue. There is a risk of bacterial or fungal contamination and infection following an eye abrasion. Chemical exposure: Exposure of the eye to household cleaning solutions, fumes, or an actual chemical splash requires immediate evaluation by a physician, though initially it may be self-treated with water or another irrigant. Keratitis: Keratitis is an inflammation of the cornea that may occur alone or simultaneously with conjunctivitis. This inflammation may be infectious (resulting from a virus, bacteria, fungus, or parasite) or noninfectious in origin. The symptoms of keratitis include blurred vision, pain, and intolerance to light (photophobia). It also may be due to contact lens overwear. Corneal swelling: Corneal swelling, or edema, is a condition in which excess fluid accumulates within the cornea. The edema causes visual disturbances such as halos or starbursts around lights. Reduced vision may or may not occur. Corneal swelling can arise as a complication of contact lenses, trauma, surgical damage to the cornea, elevated intraocular pressure or an inherited defect of the cornea. Hyperosmotic drops or ointment can be used to treat corneal swelling, but additional treatment by a physician is usually necessary. Uveitis: Uveitis is an inflammation of the eye structures in the uveal tract (the iris and other structures within the eye to which the iris attaches). Uveitis may occur without an obvious cause or may be due to trauma or an inflammatory disease present throughout the body. Symptoms and signs of uveitis include eye pain, tearing, light sensitivity, and visual blurring. Treatment is directed at both the cause of the uveitis and these symptoms. Acute angle-closure glaucoma: Angle-closure glaucoma is due to an obstruction of the system that drains aqueous fluid from the inside of the eye. As a result, fluid accumulates within the eye and the pressure within the eye increases. Some people have a tendency to develop angle-closure glaucoma because of crowding of the anatomy of the front of their eyes. It is more common in people who are hyperopic (farsighted). This disorder may be triggered after an eye exam in which the pupils have been dilated or by taking certain oral medications in the susceptible individual. Common symptoms include a severe headache or eye pain accompanied by nausea and vomiting. Vision is also usually blurry. Angle-closure glaucoma should be suspected if these symptoms develop after an agent is used to dilate the pupils for an eye exam. Most patients with acute angle-closure glaucoma in one eye are at risk for developing it in the other eye. The treatment of acute angle-closure glaucoma is surgical. There are eight types of OTC eye care products commonly available. Each product contains one or more active and inactive ingredients. A second group of chemical decongestants are the imidazoles (naphazoline, tetrahydrozoline, and oxymetazoline). Imidazoles are longer acting than phenylephrine and have fewer side effects, including rebound congestion. Caution still is recommended with imidazoles because of the potential for an increase in blood pressure. Of the three imidazoles, oxymetazoline generally appears to exhibit the least side effects. Naphazoline may dilate the pupils, more in people with lightly pigmented (blue or green) eyes. Examples of eye drops containing decongestants are Naphcon, Prefrin, and Opcon A. Artificial tear drops: Lubricants (also called artificial tears) are synthetic (manmade), water-based solutions that are used to lubricate the eye and thicken tears. Artificial tears are formulated as solutions or suspensions, varying in viscosity. Popular examples of artificial tears include AquaSite, Bion Tears, Celluvisc, Duratears, Gen Teal, HypoTears, Liquifilm Tears, OcuCoat, Refresh, Systane, Tears Naturale, and TheraTears. Many people develop sensitivity to the preservatives in these solutions, causing increasing redness, burning, or itching. Most of these products are also available in a preservative-free (PF) form. Artificial tears usually are used two to five times a day as needed for relief of symptoms. Artificial tear ointments or emollients: Ointments also are useful lubricants. These products are not water-based and contain lubricating ingredients similar to petroleum jelly. Examples of ointments include Lacri-Lube, Moisture Eyes PM, and Refresh PM. Their advantage over a water-based solution is that they remain in the eye longer. These ointments cause visual blurring immediately after their use. Therefore, they are often used only prior to sleep. Eye washes: Eye washes (also known as ocular irrigants) are used to cleanse and/or rinse debris from the eye. These products are balanced to the proper acidity and electrolyte concentration so as to be non-irritating to the eye. Washes are available as liquids or drops. These products may contain boric acid with sodium borate, sodium phosphate, or sodium hydroxide to maintain the proper acidity. Examples of washes include AK Rinse, Dacriose, and Eye-Stream. Hyperosmotics: Hyperosmotics are used to treat corneal swelling. Hyperosmotics draw water out of the cornea and thus reduce corneal swelling. Most OTC hyperosmotics contain sodium chloride in various concentrations as either a solution or an ointment. The 2% solution tends to cause less stinging and burning than the 5% solution but is much less effective in treating corneal swelling. An example of a hyperosmotic for corneal swelling is Adsorbonac. Scrubs: Eyelid scrubs are useful for removing oils, debris, or loose skin that can be associated with eyelid inflammation. Soap agents provide the foaming action. An example of this type of product is Eye-Scrub. Decongestants: Decongestants are used to shrink swollen blood vessels in the congested (red) eye, for example, in conjunctivitis. Phenylephrine is the most common decongestant for this purpose. Patients at risk for angle-closure glaucoma should cautiously use phenylephrine because it can cause an attack of the disease. Rebound congestion, in which blood vessels become dilated even with continued use of decongestants, is a common side effect of phenylephrine. Therefore, if no improvement in redness or symptoms occurs within 72 hours of use, phenylephrine should be discontinued. A frequent side effect of phenylephrine is dilation of the pupils. If phenylephrine is absorbed from the eye into the body, an increase in blood pressure may occur, although this is rare. Nevertheless, patients with high blood pressure should be cautious in using phenylephrine. Additionally, if phenylephrine is absorbed, side effects may occur due to interactions with atropine, tricyclic antidepressants (imipramine), and monoamine oxidase inhibitors such as phenelzine sulfate (Nardil) or tranylcypromine sulfate (Parnate), reserpine (Hydropres), guanethidine (Ismelin), or methyldopa (Aldomet). Antihistamines: Ocular antihistamines are available OTC. These antihistamines are combined with ocular decongestants for the treatment of congestion (conjunctivitis), particularly when caused by allergy. Pheniramine maleate and antazoline both block histamine receptors in the eye, and thus provide relief from the symptoms of itchy, watery eyes. Antazoline may increase pressure slightly in the eye (of concern to patients with glaucoma) whereas pheniramine maleate has little effect on pressure. Common side effects of antihistamines include burning, stinging, and discomfort in the eye. Important side effects that may be associated with oral antihistamines have not been reported with ocular antihistamines. Antihistamines should not be used in patients at risk for developing angle-closure glaucoma. Examples of products that combine an antihistamine and decongestant are Naphcon A and Ocuhist. Newer allergy eye-drop preparations: Recently, new classes of eye drops for the treatment of itching due to allergy have become available over the counter. Zaditor, a nonsteroidal anti-inflammatory drop, is an example of these. Superficial foreign bodies: Lint, dust, an eyelash, or other foreign matter can become stuck on the surface of the eye or under the lids. When the substance cannot easily be removed either with your finger, water, or an eye irrigating solution, a doctor should be seen. Thermal damage: Thermal damage is a burn injury to the eye itself. Exposure to the sun's UV radiation during outdoor activities is an example of minor ocular thermal damage. This commonly affects both, rather than one, eye. An eye lubricant can be applied to soothe the eyes. If there is no relief of the symptoms of pain, irritation or burning of the eyes after 24 hours, a physician should be seen. A more severe thermal injury to the eyes, for example from a welder's arc or from sunlamp exposure, warrants the immediate attention of a doctor. Conjunctivitis: Bacteria, viruses, fungi, allergic substances, or inflammation-promoting agents can cause inflammation of the palpebral and bulbar conjunctiva, also known as conjunctivitis. The inflammation causes enlargement of the blood vessels in the conjunctiva ("congestion") and causes the conjunctiva to become red ("bloodshot"). Itchy eyes may or may not accompany the inflammation. The eyelids may be stuck together in the morning and there may be tearing or discharge from the eye or eyes. The congestion and itchiness can be temporarily treated with ocular decongestants or wetting drops, but the underlying cause may need treatment from a physician. Dry eye: Dry eye is characterized by a white or mildly reddened eye combined with a sandy, gritty, dry feeling. Paradoxically, dry eye can sometimes be accompanied by excessive reflex tearing, with the dryness itself stimulating an increase in the production of tears. Dry eye, also known as DES (dry eye syndrome) or KCS (keratoconjunctivitis sicca), is very common and is increasing in frequency due to an aging population and environmental factors such as increased pollution in the air. Dry eye symptoms are worse at high altitudes and in low humidity situations, such as in airplanes. Dry eye is more common in females. It is sometimes associated with dry mouth (Sjögren's syndrome) or other autoimmune diseases. Other factors thought to contribute to dry eye are some drugs such as antihistamines, antidepressants, or diuretics (water pills). There are many OTC eyedrops available for the self-medication of dry eyes. These vary in their formulations, consistency, and preservatives used. Although these lubricants are effective for treating many cases of dry eye, a physician also should be consulted. The eyes are extremely complex sensory organs. About 85% of the total sensory input to our brains originates from our sense of sight, while merely 15% comes from the other four senses of hearing, smell, touch, and taste. The eyes are designed to optimize unobstructed vision under conditions of varying light. Their location, on the outside of the face, makes them susceptible to trauma, environmental chemicals and particles, and infectious agents. The eyelids and the position of the eye within the bones of the orbital cavity are the major protective mechanisms for the eye. The eye itself has the shape of a sphere measuring about 1 inch in diameter. It consists of a clear, transparent dome at the front (the cornea) that is surrounded by the white of the eyeball (the sclera). The iris of the eye is the circular, colored portion within the eye. Behind the cornea is located the pupil, which is the central opening within the iris. Behind the iris and pupil is the eye's lens. The space between the back of the cornea and the front of the lens is called the anterior chamber and is filled with a fluid, called the aqueous humor. Behind the lens is a large space that is filled by the transparent vitreous liquid gel. The inside of the back of the eye is lined by the retina, the thin, light-sensitive tissue that changes light images to electrical signals via a chemical reaction. These electrical signals generated by the retina are sent to the brain through the optic nerve. Our brain interprets what our eyes see. The inner sides of the eyelids, which touch the front surface of surface of the eye, are covered by a thin membrane (the palpebral conjunctiva) that produces mucus to lubricate the eye. This thin membrane folds back on itself and covers the visible sclera of the eyeball. (This continuation of the palpebral conjunctiva is called the bulbar conjunctiva.) Natural oil for the tears is produced by tiny glands located at the edges of the eyelids, providing additional lubrication for the eye. The main component of tears is formed by the lacrimal gland located under the upper lid at the outer corner of each eye. The tears are composed of a combination of the substances produced by the lacrimal gland, the oil glands, and the mucus glands. Tears flow toward the nasal side of the eye and drain into the lacrimal sac, located in the area between the eye and the side of the nose, and then ultimately into the nose. Most eye care products contain ingredients that have no therapeutic value. If an individual has a known sensitivity to one or more of these ingredients, then products containing them should be avoided. Vehicles: An ophthalmic vehicle is added to a product to enhance drug action by increasing the viscosity (thickness) of the product. Examples of ophthalmic vehicles are Dextran 70, gelatin, glycerin, poloxamer 407, and propylene glycol. Preservatives: Preservatives are included to destroy or limit growth of bacteria that may be introduced into the product during repeated use. Examples of ophthalmic preservatives are benzalkonium chloride (BAK), cetylpyridinium chloride, chlorobutanol, methylparaben, sodium benzoate, and sorbic acid. To avoid allergies, many ophthalmic products are preservative free and are supplied in tiny containers, which once used, are discarded. Hordeolum: Commonly referred to as a stye, a hordeolum is an inflammation of one or more obstructed glands within the eyelid, typically with infection caused by bacteria similar to those linked to blepharitis. 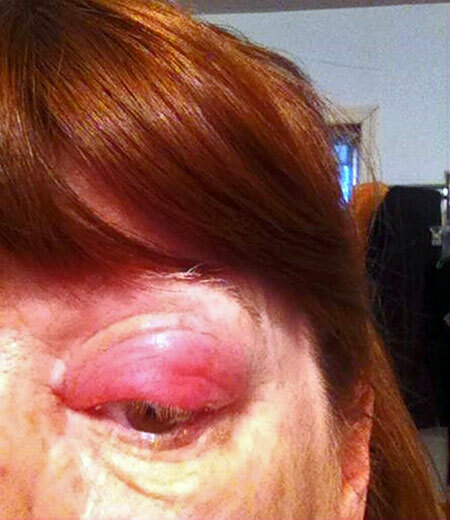 The primary sign of a hordeolum is a tender, raised nodule on the eyelid. Sometimes, the eyelid is so swollen that the eye appears to be completely shut. Recurrent hordeola can be associated with acne rosacea. Treatment usually is with hot compresses several times per day, but if the problem worsens or does not clear within a week, a physician should be seen. Topical or oral antibiotics may be necessary. Chalazion: A chalazion looks similar to a hordeolum and is also secondary to an obstruction of one of the glands of the eyelid. A chalazion is a raised nodule without the tenderness of a hordeolum. It usually does not harbor any infection. Like a hordeolum, it is treated with hot compresses. If the chalazion persists, a physician should be consulted. Although this is not a tumor, surgical removal may be necessary for cosmetic or comfort reasons. Braunwald, Eugene, et al. Harrisons's Principles of Internal Medicine. 15th ed. McGraw-Hill, 2001. Moorfields Eye Hospital NHS Foundation Trust. "Common Eye Condition Management." <https://www.moorfields.nhs.uk/sites/default/files/GP%20Handbook%20-%20Common%20eye%20condition%20management.pdf>.